Prepare a double boiler, boil water and place a glass bowl in side. Remember that the bowl should not reach the bottom. Set the heat to low to keep the water hot. Pour in the chocolate and stir with a rubber spatula. Once it’s completely melted pour into a pastry sleeve or a plastic bottle with a small tip. Fill the mold with chocolate, add the cookie, push it in a little and cover again with chocolate. Carefully tap the mold against a flat surface. Make sure all the cookies are covered in chocolate. Place the mold in the fridge to let cool for 15 minutes, once hardened remove from the mold and enjoy. You can use whichever type of cookie you prefer. These cookie-stuffed chocolates will delight kids and adults alike. Everyone will love these deliciously crunchy treats. 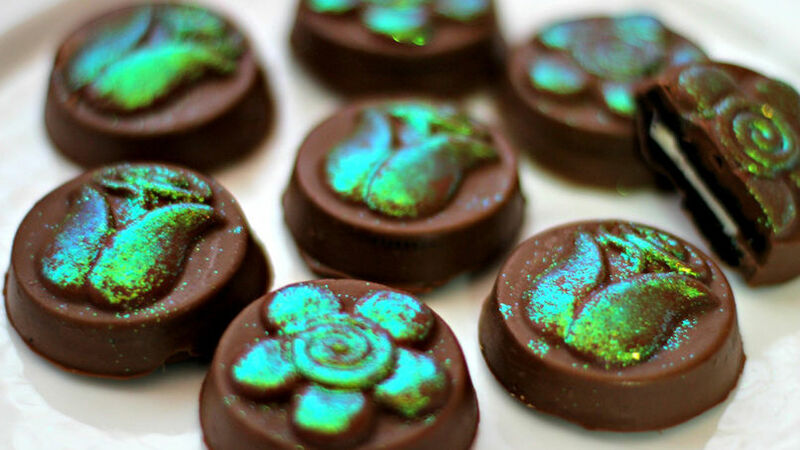 You can use dark, white or colorful chocolate. The decoration can be made of different colors of chocolate or use edible glitter like I did here.